President Trump’s 2016 campaign was one of sweeping false promises. Tonight, during his State of the Union address in Speaker Pelosi’s House chamber, Trump will make his case for re-election. We’re holding him accountable, and we need your help. Candidate Trump promised to tax the rich, ensure clean water and air, protect health care, find a humane solution for Dreamers, and so much more. Every false promise is a betrayal to Americans. 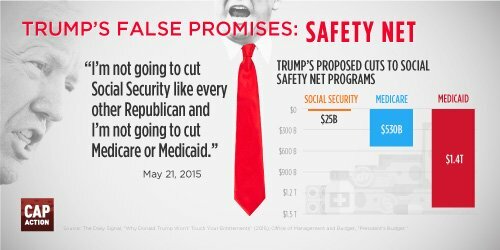 Head to TrumpFalsePromises.org for click-to-tweet shareable content debunking each of Trump’s lies. Use the hashtag #TrumpFalsePromises on Twitter. Trump’s nominee to replace Brett Kavanaugh on the DC Circuit Court of Appeals is almost as alarming as her predecessor. Neomi Rao has a disturbing record on issues across the board: sexual assault and women’s rights, disability rights, racial justice, LGBTQ rights, presidential powers, environmental and health protections, and more. She made a flimsy attempt to assuage fears during her confirmation hearing today before the Senate Judiciary Committee. Bottom line? Rao’s stances and previous actions are disqualifying for a seat on the second highest court in the land.